31.07.07 – By Francisco Cairol: One of the worst things about being a boxing fan is seeing wasted talent. Those boxers who could have accomplished so much more in their boxing careers if only they had been responsible, trained harder and led better life. Today, I will write about Edwin “Chapo” Rosario and Hector “Macho” Camacho. You might say: “Wait a minute, weren’t those guys multiple champions with a lot of great quality wins? True, but they could have done so much more. 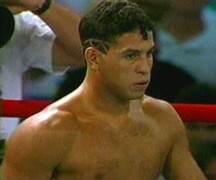 Hector Camacho: 78-5-2 37 KOs. Hector Camacho had some of the best talent this writer has seen. He had unbelievably fast handspeed, great movements and decent power at Jr. Lightweight and lightweight. He won the WBC Jr. lightweight title in dazzling fashion over an admittedly shopworn Bazooka Limón in just his 22nd fight in August 1983. Camacho made just one defense of the title against worthy challenger and fellow Puerto Rican Rafael Solis (KO5), in November 1983, before moving on to lightweight. There Camacho won the title and had his best win with a very convincing unanimous decision over the very tough and durable Jose Luis Ramirez, in August 1985, even knocking him down along the way. Camacho’s first defense of the title was against Edwin “Chapo” Rosario, in June 1986. This was a fight that changed Camacho forever and not for the best. He showed heart and grit in having to recover from being hurt by Rosario’s booming right hand and left hooks in both the fifth and eleventh round to eek out a very close, controversial, but not necessarily inaccurate, split decision victory. After this fight Hector, lost all taste for aggression and became a safety first fighter. After one more defense against Cornelius Boza Edwards, in September 1986, Camacho moved up to Jr. Welterweight, where he fought a come backing Ray Mancini, in March 1989 and was awarded the WBO Jr. welterweight title via split decision after an uneventful 12 rounds. Camacho defended against Vinny Pazienzia (w12), in February 1990 and Tony Baltazar (w12), in August 1990, before losing the title to Greg Haugen in a 12 round decision in February 1991. Camacho lost the chance to retain the title via a draw when was decucted a point for refusing to touch gloves with Haugen before the final round. Camacho won back the title in a rematch against Haugen (w12), in May 1991, before taking on the great Julio Cesar Chavez. He was thoroughly dominated by Chavez over 12 rounds. This writer only awarded Camacho round five, where ironically Camacho was momentarily the aggressor and was effective at it if memory serves. Camacho moved up to welterweight where he faced Felix Trinidad for the WBC Welterweight title, in January 1994. Camacho managed to win a couple of rounds, before losing a unanimous 12-round decision, in which he was badly beaten. His next fight against a name opponent was two years later against 44-year old Roberto “Hands of Stone” Duran for something called the IBC middleweight championship, in June 1996. Camacho won a much closer than announced 12-round decision. You could make a case for Duran actually winning that one, though, as he appeared to do enough to get the win. A year later, Camacho faced a come backing and completely shot Sugar Ray Leonard, scoring a 5th round TKO, in March 1997. In his last important fight, Camacho dropped down to welterweight to challenge Oscar De La Hoya, where Camacho probably lost every single round in dropping a 12 round unanimous decision, in September 1997. Camacho has kept on fighting third rate opponents since then. Now, there is no shame in losing to Julio Cesar Chavez, Oscar De La Hoya, Felix Trinidad or even to Greg Haugen on a technicality. The thing is, Camacho’s not-so-spartan training habits, well documented problems with the law because of possession of drugs and his change to a safety first style of boxing, has been very detrimental to his talent. As he became older, he depended more on his natural talent, his legs, and moved his hands less and less in order to win or just survive. Now, I am not saying he would have beaten Chavez, Trinidad and De la Hoya had he trained and lived right. I don’t think he should have moved up from lightweight or junior welterweight to begin with. As it is, I just happen to think that even with all the quality wins and those losses to top quality opposition, he still was an underachiever. He once had that much talent. On a similar note, Hector Camacho Jr., who for a small while looked like he had some of his father’s talent and the dedication that his father lacked, but who has now lost three fights by under-training and being overweight. I don’t even know if he’s really a boxer anymore. Edwin “Chapo” Rosario: 47-6-0 (41). Rosario was also unbelievably talented, with great power in both hands, solid boxing skills and superb lateral movements. He won his first title at lightweight, earning a very tough and close 12-round unanimous decision win over Jose Luis Ramirez in May 1983. Following that, his first defense was a first round knockout of Robert Elizondo in March 1984. He then faced Howard Davis Jr., where a closing seconds knockdown in the 12th round helped Rosario win a very close split decision. He then gave Ramirez a Rematch in November 1984, a bout in which Rosario Looked sensational in the first two rounds, completely dominating Ramirez and knocking him down twice. However, Rosario quickly ran out of gas shortly thereafter, and was stopped by Ramirez in the fourth. Two wins later, Rosario won a very close decision over the very tough and crafty Frankie “The Surgeon” Randall, in June 1985, to receive another title shot to Ramirez conqueror, Hector “Macho” Camacho in June 1986. As stated above, Rosario rocked Camacho like never before before losing a close, and somewhat controversial split decision. Rosario’s next fight was a title shot against Livingstone Bramble in September 1986. In one of his best wins of his career, Rosario destroyed Bramble via second round KO. Rosario successfully defended his title once with an 8th round stoppage of fellow Puerto Rican, Juan Nazario in August 1987, before taking on Julio Cesar Chavez three months later, in November 1987. Rosario fought hard but the Great Chavez totally destroyed him on his way to a 11th round TKO. Rosario regained WBA lightweight title when he knocked out Anthony Jones in six rounds in July 1989, only to lose it in his first defense via 8th round TKO against former victim, Juan Nazario in April 1990. Rosario then moved up to Jr welterweight and won the title from Loreto Garza with a 3rd round KO, in June 1991, before losing it in his first defense against Akinobu Hiranaka in a first round TKO loss in April 1992. His last notable fight was a seven-round TKO loss to Frankie Randall in January 1993. Rosario started a comeback a couple of years later that ended prematurely with his death. I think his death was officially by an aneurysm but unofficially drug related. Sad. In terms of Boxing Rosario story is also sadder than Camacho’s because he lost some fights he probably shouldn’t have lost. His personal problems, lack of training and drug use could very well be the real reason he lost to former victims Ramirez, Nazario & Randall in rematches. And no offense to Hiranaka, who did what he had to but, from what I can see, had Rosario been right he probably would not have lost that night. Even Rosario’s chin was great when he was on! How else could he have withstood eleven rounds of a prime Chavez pounding or a prime Ramirez in their first fight? Ces’t la vie. It is a sad story indeed, and there are many other examples of wasted talent but at least both of these men were willing and able to accomplish enough to be on the IBHOF (Rosario is already inducted, and Camacho should be inducted once he’s eligible). still it’s hard to not think of what might have been, as they could really have been so much greater, I think.